Hello Friends and thank you for visiting my blog today!! I used the Mermaid (SSO1), seahorse (SSO3), and cute little beach balls and bucket (SS17) black and white Digi stamps to create some fun goodies! As many of you know, my favorite tool is my Silhouette SD. I use it in most of my paper crafting. So all of the projects that I created in this post were done using the Print and Cut feature of my Silhouette SD. WANT TO WIN A SILHOUETTE SD????? Just click on that link (above)..it will take you to the The flying Unicorn blog which is where you will want to start the Blog hop and read the RULES. Here are the Digi's that I "painted in GIMP"
Here are the creations that I made with these images. This is a fun summery Easel card. I used Utee on the mermaid, beachballs and seahorse. Here is a close up of the bottom. I used my Silhouette SD to create a shaped book mark for my younger son. I used Ranger Perfect Pearls Mist in turquoise on the whole bookmark, both sides. I then used Blue Tinsel embossing powder to emboss the edges of both sides, I also covered the whole thing with UTEE. So it is nice and shimmery! This side says.."Catch a Wave" which is the name of the digital paper from Gecko Galz that I used. This side says "Read a book." I also made this incentive journal for my younger son. I used all the images to create a 7" BINGO card...but used the word "BEACH"..I then used the number 15 inside each bingo spot..representing "15 minutes of reading"...and when he has 5 in a row..or a BINGO...I will take him to the dollar store to get some special snacks to take to the beach with us (we don't live to far from a small lake with a beach..and go frequently..and the boys always want something special to snack on there). I used the Garden Icons Stamp Set to stamp on the bubble and star shapes. I used Blue tinsel and Jeweled Gold embossing powders. I also applied UTEE to the "BEACH," Mermaid, and beach balls. I did create the Bingo card using the "Catch a wave" digital paper from Gecko Galz...and used my Sihouette SD's print and cut feature to cut out the cover, back and inside pages. The front and back have been glued to one of the priority mail boxes that some goodies where sent to me in. Here is a close up of cover (the back cover is identical). I used my cinch and 3/4" black ring binder. I did color in my Mermaid a little with copic markers. Barely Beige (E11) for her skin, Cadmium Orange (YR07) to fill in the hair. Cadmium Red (R27) for her necklace, and Sardoynx (R21) to fill in the mermaid tail. Here are some photos of the inside pages. I made this journal so my son can practice writing and have some fun drawing too. Here I used the Sunny Alphabet Soup letters from Gecko Galz! I love the bright colors of the sun!! Here is the third page below. I decided to put the binding at the top..so it will be easier for him to just flip the pages up and over. There are 18 pages (6 of each page above) total. Hope this inspires you to create a fun summery project!! 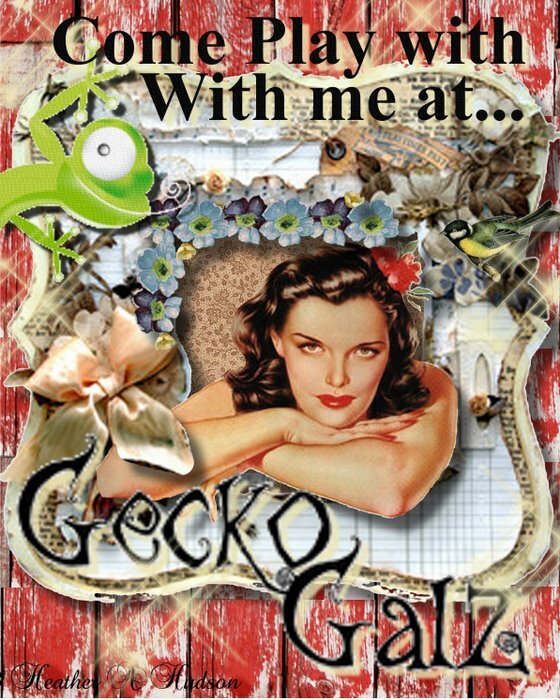 Gecko Galz Frame Digi "At the Mall"
It is a really fun challenge blog! Just follow the link above and it will take you there. "Simon Says Stamp and Show...Metal"
Here is the digi image. I made a collage on a piece of cardboard. I cut a piece of cardboard, painted it pink, stamped it with the tiny leaf stamp I made, then inked it with Ranger's Fired Brick and Vintage photo. I added some lace, flowers, the antique buttons from the "mall" and a few stickpins and stickles. Some more antique buttons, flowers, metal charm..and stickles. The tiny leaf stamp is one of my favorites that I made. I can tuck some leaves in where ever I feel there is too much "white space." I have also found another link up site...you gotta check it out..
Hello Friends...and Welcome to my Blog! $199.99. So click on the DIY link above and it will take you where you need to go to get the code! I thought I would share some photos of what I have created with my Silhouette SD to show you why I love it sooo much!! I am linky up some of my creations at the DIY blog. I used my SIlhouette SD to CUT THEM OUT!! No FUSSY cutting here..although many compliment me on it...so I just give my SIlhouette A big HUG...because I know it did the work. All the lettering here and my Photos were all printed and then my Silhouette READ the registration marks...so IT cut out my photos and words! Please forgive my photos...It was winter and hard to get a good photo! I used GIMP to clean up my Graphic Fairy images and used my Silhouette to cut them out. You can see the pieces below!! I stamped with one of the stamps I carved myself ...I have a tutorial on here somewhere...LOL. I just love how the flowers turned out. The Bird to the right, all the lettering..and that fabulous circle of white flowers with the bludbird were all cut by my Silhouette. Here are how the pieces look on my paper..before they are cut out by my silhouette..see the three registration marks (look like the letter "L" in three corners. The Silhouette reads those and then knows where to cut your images. One of my first Paperbag mini albums that I sold on Etsy. I acutally painted the roses in GIMP and then used my Silhouette Sd to print and cut..and make shaped tags. All stamping is with stamps I made as well. The bat tag, pumpkin..black cat..and even the brick wall I did with the silhouette! Well...if that is not enough to convince you to get a Silhouette...then just keep watching my blog..there are more goodies coming soon! Well...Mondays...are my "Free" day..lots of time to play. Today I finished another DT project for Scraptales. Shawn (click here for her tutorial). I used the Graphic 45 Circus papers that Linda gave me at Scraptales and this is what I came up with...kind of fun! "My boys are" and then used some of them whole. The words and button flower are raised with pop dots! Close up ..I printed the photos on card stock and used GIMP to clean up the image..and my Silhouette SD's print and cut feature to cut it out. Here is my oldest son...he is just like his papa...LOL. That is a great thing! I used some more antique buttons and a Sizzix die to cut the little circles. Art Glitter Designer glue...hold all my pieces on. It does fold closed..but I will be keeping it on my desk..for a good giggle now and then. I just have to say..my son had gone with his dad to get his hair cut this day..and it went from a little long...to TOO short. It is much better now...:-) He liked it. I am linking this up to The Flying Unicorn Lucky 7 Challenge! 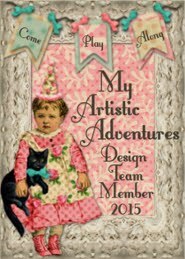 I have just found another awesome site where you can link up and share your creative treasures!! Passionately Artistic!! Linda at Scraptales gave me some of the Graphic 45 Circus paper to play with this month. I created my Father's Day card with this paper and an image I created using Graphic Fairy images and Gecko Galz images. I also did a FUN GUY layout. I used vintage photo and spiced marmalade on the edges of my papers. I used my Silhouette SD to print and cut my two sons and the photo of my DH out..as well as the lettering and cute top hats! 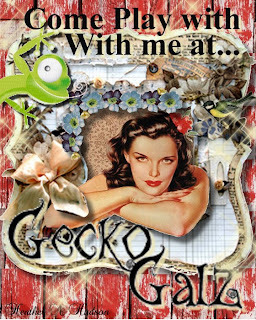 Using GIMP, I placed my DH's photo into one of Gecko Galz Vintage Circus Frames. It was just perfect for this paper line! If you would like to learn how to use GIMP and learn some beginning digital work...please check out my free group at Bella Creations. Lucky 7 Button Challenge at the Flying Unicorn. 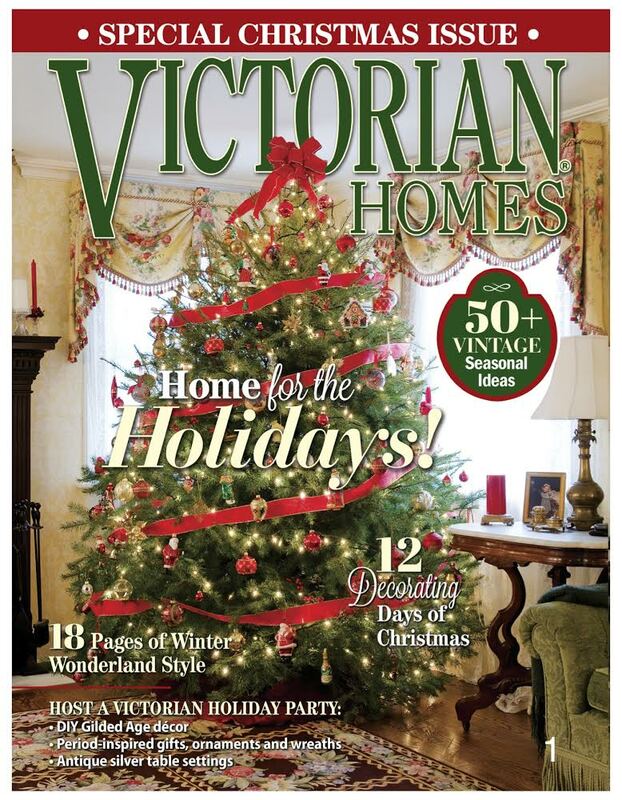 Alda and Frank have their First Ezine published there and it is FANTASTIC! So check it out! I thought I would add a bit more to the DIY link up. You really need to check out this blog..very motivating! I have been having so much fun with paper crafting..and digi work..like below...I thought I would share some of my other crafting! This was a white rocking chair that my younger son's teacher asked me to paint. So..I brought my paints to the school..and painted this chair right in the classroom...so all the kids got to watch. It was the end of the year...during a party. I will say..I did a lot of volunteering in the school..and I find that when I walk into the middle school (kids are older...so not much volunteering now)...those kids always remember me...and Say..Mrs. Hudson...remember when you painted ...blah blah blah...LOL. So..go do something fun with your kids class...and it will get you an "IN"...where they might just think you are cool..when they are older...which is a goooooood thing! I have a really good friend who I provide respite care for her DD who has Down Syndrome. My friend is the most giving person I have ever met..and she always see things in a positive light. "For a Beautiful Princess" behind the door and my GF's DD said..."That is my name...Beautiful Princess." Her mother and I just laughed...because we knew that..LOL. Her little knick Knack table. One more..did this while the kids were out at Recess...and at Lunch. Each class had there own bathroom..which was nice. I really wanted to redo the cat...LOL..it is hard to get detail on a non smooth concrete brick surface..but the kids love it. Okay...I am sure you have had enough! Go..and enjoy the rest of your day...and hopefully you learned something new about me today! Exciting News...I'm a Gecko Galz DT Member!! My DT Envelope and Tag Winner! Bella Creations Blog Hop...and "Heavenly Kit"